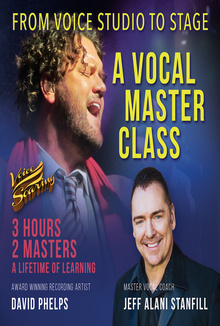 A vocal master class, co-taught by master vocal coach of the Swedish-Italian vocal technique, Jeff Alani Stanfill, and Grammy and Dove award-winning Gospel tenor David Phelps. A vocal master class, co-taught by master vocal coach of the Swedish-Italian vocal technique, Jeff Alani Stanfill, and Grammy and Dove award-winning Gospel tenor David Phelps. This intimate, exciting and informative class filmed in Manhattan, features participants who came from all around the U.S. and Canada to expand their knowledge of vocal technique and learn performance strategies from an internationally renowned artist and master vocal coach. This video highlights 3 of 8 singers from the genres of pop, rock, musical theater, R&B and opera, who received coaching from David Phelps and Jeff Alani Stanfill. First, the featured singers vocalize and warm up under Jeff's guidance, using exercises from the Swedish Italian vocal technique, before they sing a song. After each singer performs their song, David coaches them on vocal technique, stage presence and song interpretation. The video also features an exclusive peek into David Phelps’ vocal preparation! You will see David and Jeff work together, as David vocalizes in front of the class before singing one of his biggest hits. Stream or download the masterclass.